Ole Miss, 15-7 (5-4), found that out Wednesday after squeaking by a dismal Texas A&M team, 8-13 (1-8), with a score of 75-71 and snapping a four game losing streak. The Rebels will make the journey to Athens, Georgia on Saturday, where another basement dweller in the SEC will be awaiting their arrival. The Bulldogs sit at 10-12 (1-8) headed into the matchup. 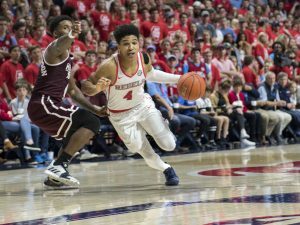 Ole Miss scratched and clawed its way to a victory at home versus Texas A&M through stingy defense and timely scoring. With the win, the Rebels put a halt to their worst stretch of the season after losing four-straight and five of the last six. Senior guard Terence Davis played with a sense of desperation on Wednesday night, finishing with 19 points and eight rebounds. He also had an outstanding performance on the defensive end with a career-high of seven steals. Georgia is in the midst of its own struggles. After dropping a contest Wednesday on the road at Alabama 89-74, the Bulldogs have now lost three games in a row. Georgia matches up surprisingly well with the Rebels, however. Ole Miss will be tested inside with Georgia, who ranks eighth in the country in rebounding. Nicolas Claxton, a 6-foot-11-inch sophomore, is the catalyst of the unit, scoring 12.3 points per game while also leading the SEC in rebounds at 9.3 and blocks per game with 2.7. The tandem of big men for the Rebels in Dominik Olejniczak and Bruce Stevens has struggled with rebounding the ball as of late. In the last two games, the duo has combined for just eight boards while logging a combined 80 minutes. The Rebels need to improve on their rebounding if they intend to take care of business Saturday afternoon. Claxton isn’t the only potential problem for Ole Miss. Georgia has a quartet of players scoring in double figures. The 6-foot-8-inch sophomore forward, Rayshaun Hammonds, leads the Bulldogs with 12.6 points and will be paired with Claxton in the frontcourt. Derek Ogbeide and Tyree Crump will check in on Saturday averaging a hair over 10 PPG each. Ole Miss has not won a road game in nearly a month, with the last win coming on Jan. 12 at Mississippi State. However, good teams find ways to win on the road, especially against teams in the bottom tier of the conference, which is exactly the position Georgia finds itself in. In order to continue plugging away at the SEC, the Rebels have to capitalize on a soft spot in their schedule against Georgia, who sits at No. 105 in the ever-so-important NET rankings. 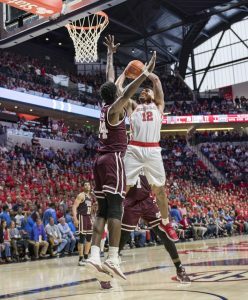 While a win will not impact the Rebels’ standing in the eyes of many, a loss would be devastating for the Rebels’ prospects at a respectable seed in the NCAA tournament.